Walter Tschinkel's passion for fire ants has been stoked by over 30 years of exploring the rhythm and drama of Solenopsis invicta's biology. Since South American fire ants arrived in Mobile, Alabama, in the 1940s, they have spread to become one of the most reviled pests in the Sunbelt. 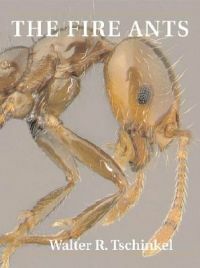 In "Fire Ants", Tschinkel provides not just an encyclopaedic overview of S. invicta - how they found colonies, construct and defend their nests, forage and distribute food, struggle among themselves for primacy, and even relocate entire colonies - but a lively account of how research is done, how science establishes facts, and the pleasures and problems of a scientific career. Between chapters detailed enough for experts but readily accessible to any educated reader, 'interludes' provide vivid verbal images of the world of fire ants and the people who study them. Early chapters describe the several failed, and heavily politically influenced, eradication campaigns, and later ones, the remarkable spread of S. invicta's 'polygyne' form, in which nests harbour multiple queens and colonies reproduce by 'budding'. The reader learns much about ants, the practice of science, and humans' role in the fire ant's North American success. Walter R. Tschinkel is a Distinguished Research Professor of Biological Science at Florida State University.